that goes with us on a journey. as how much we have lived." It sank in the middle but it tasted yum and that's all that matters to me! P.S. For a never-fail, moist cake; stick to the original ingredients. If you don't mind a cake that sinks slightly in the centre but prefer not to use sugar, then use the substitutions). Whisk eggs and sugar (or honey) together. 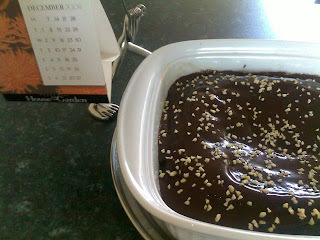 Melt cocoa powder in hot water and allow to cool slightly. Then whisk it into the sugar (or honey) and egg mixture. Add in the vanilla essence if you are using it. Mix in flour, salt and baking powder (or bicarb + creme of tartar). Bake in a buttered oven dish for 25 - 30 minutes at 180 degrees Celsius. 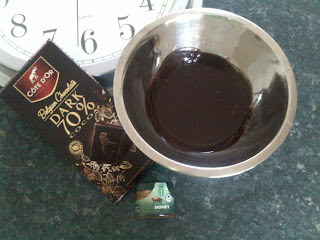 Melt the dark chocolate into the cream on low heat. Add honey if you'd like a sweeter taste. Add butter once off the heat to give the icing a nice sheen. Sprinkle with almond nibs to decorate. and have a fun (but safe) New Year's Eve! Psst! I have this past life as a dessert baker - was in fancy restaurants, got good reviews. At about the same time I was close to someone with gluten intolerance. I know things. If you dig choccie, then you simply HAVE to try the Lindt Dark Hazelnut. It's out-of-this-world good. The perfect balance of dark, sweet and nutty. I used to have a stack of recipe cards and a book, all gluten free. I wonder where they are, or if I still have them!